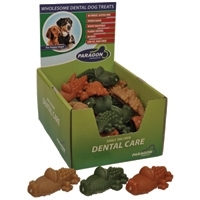 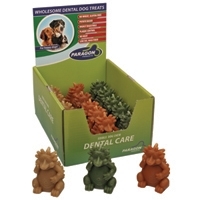 Wholesome, dental dog treats. 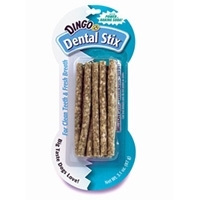 Helps to control plaque. 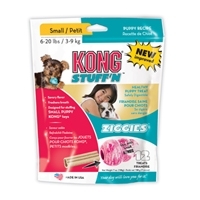 No wheat, gluten free, highly digestible, low fat, high fiber, potato based. 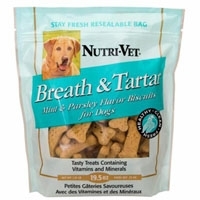 Nutri-Vet Breath & Tartar Mint & Parsley Medium Biscuit 19.5 oz. 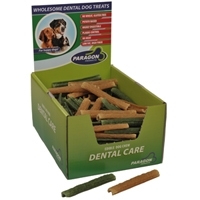 Parsley, peppermint and spearmint freshen breath, aid digestion and help clean teeth. 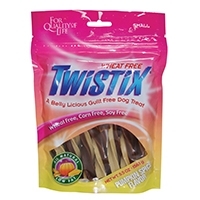 SensiBelly ® is an all-natural veggie based treat that is wheat free, corn free and soy free, therefore, the ideal treat for companions with food sensitivities or allergies. 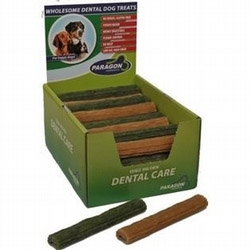 SensiBelly ® contains rice and potato starch, which are mild on the stomach while ginger, cinnamon, anise, fennel and peppermint soothe the stomach and aid the digestion process. 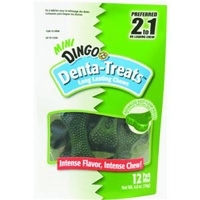 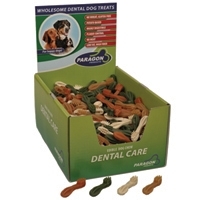 Treat your dog with the Dingo Denta Treats Teeth Whitening Chews for better oral health. 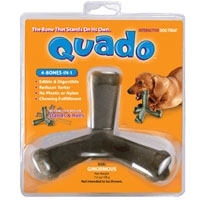 These bone-shaped rawhide dog chews are delicious and they double up as breath-fresheners. 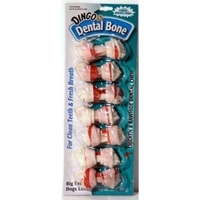 Dingo Dental Bone Medium White 5.5" - 6.0"
Dingo Dental Bone Small White 3.5"-4.0"
And guess what, we've got something special for your dog to chew on! 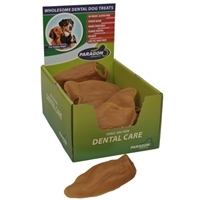 Our Nylabone Pro Action Dental Dog Chew is an advanced K-9 dental device that provides triple cleaning performance and triple the fun. 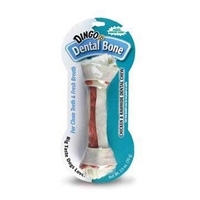 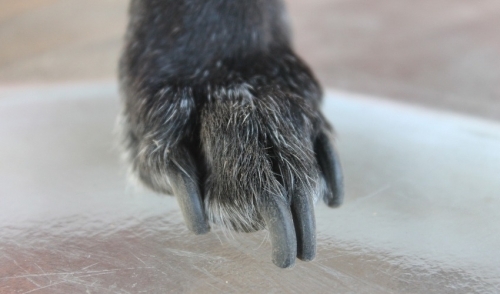 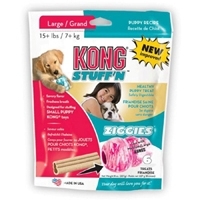 The triple texture of the chew features durable nylon ends that are super long-lasting for powerful chewers while the softer center helps massage gums. 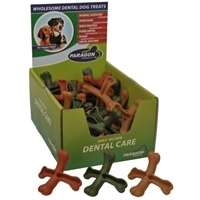 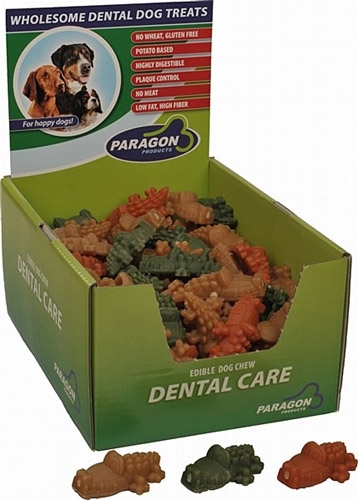 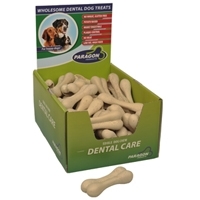 Our chews are guaranteed to reduce tartar, help clean teeth, massage gums and promote fresh breath.